More than a year ago, the City of Dyer Utilities department began a major project to replace all the old water meters with new, high accuracy water meters. In addition to being extremely accurate, these water meters can be read remotely (a staff member drives by and reads them with a computer). This reduces errors and is very quick — in fact, in order to track leaks, the City reads water meters every week (instead of only once per month). The new meters are digital and the consumption is displayed right on the face in gallons. 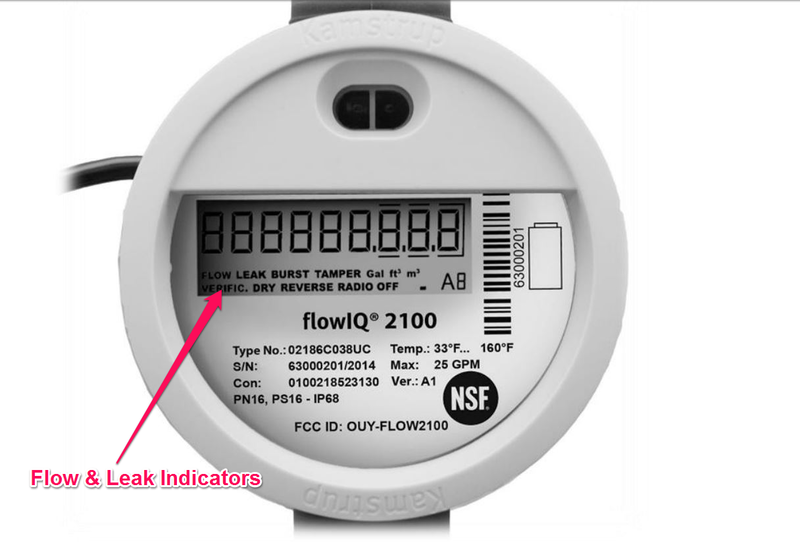 Additionally, the meters show indicators (or “flags”) for flow (when water is flowing), leaks, and bursts. You can see these indicators yourself, though you might need a flashlight. Note: Since the meters are now read electronically, you may notice some dirt and sediment built up in your meter box. Closer view of meter face with “Flow” and “Leak” highlighted. If your meter displays “LEAK”, it means that water has flowed through the meter continuously for at least 24 hours. If your meter displays “BURST”, it means that a high volume of water flowed through the meter in a 30 minute period. Both of these indicators are reported automatically to City Hall when the meters are read (usually weekly) — and you may get a call from city hall to notify you of the possibility of a leak. If you have questions about your meter or your readings, please contact City Hall.